This is another advert for an official Apple clone from the days before Apple changed its mind and decided it wasn't going to allow such things. Rather than a straight-up Apple II clone, like 1980's ITT 2020, The XCalibur was modelled after machines like the Osborne 1 or Commodore SX64 - as in it was supposedly portable, even though it weighed 27lbs (just over 12kg) and required a power supply, and had a mostly-useless 5" screen. 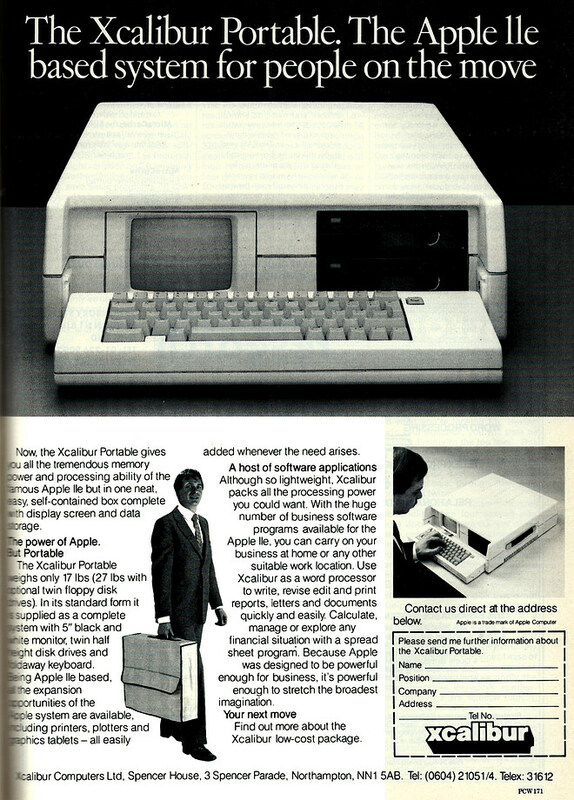 It also complied with rules of the day which stated that adverts for luggable computers absolutely had to include someone in a suit pretending that it didn't weigh a ton.